Crisis what crisis? | Crisis? What Crisis? ‘Crisis? 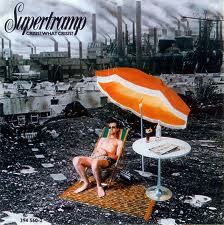 What crisis?’ was a 1975 album by prog rock band Supertramp, surely one of the uncoolest bands of the decade – all middlebrow musicianship and long songs about dreaming at a time when anger and abrasive three minute polemics were called for. Being crushingly uncool at the time myself, they were the first band I chose to see ‘live’. In 1977 of all years. But I remember the cover of the album did at least attempt to capture the spirit of the times – a sun bather in a deckchair before a dystopian industrial landscape, all belching chimneys and litter strewn wasteland. In much the same spirit, the ‘Crisis’ phrase re-appeared in a 1979 Sun headline when the red top claimed PM Jim Callaghan had uttered the words as he left the country to go on holiday during the winter of discontent. Though apparently he never did say it, the Murdoch press just getting into its stride in those days. Nobody would dare utter it today, surely. Our current crisis seems obvious enough – in Europe and the US it’s one of unemployment and wasted lives, especially youth; of poverty, yes, but of inequality more. Of decrepit and run-down residential districts, retail areas with the life sucked out of them. The more pessimistic would add a pandemic of mental health problems, addiction, obesity. But I wonder if SuperT weren’t on to something after all. Not that there isn’t a crisis, but whether we are clear enough in understanding what that crisis really is about. Since the crisis broke in 2008 the general media message has been that we need to get back to ‘normal’ as quickly as possible – economic growth, consumer spending, lending and borrowing. But that line closes off debate about an alternative scenario. Like, perhaps we would be better off adapting to the reality of lower economic activity? Exploring that alternative is the theme of this blog. As SuperT would put it, ‘dreamer, nothing but a dreamer’? This entry was posted in Uncategorized and tagged crisis, inequality, stagnation, well-being. Bookmark the permalink.